Join the GRC & IT Webinar Series for byte-sized sessions aimed at making federal regulations understandable and actionable. The challenge: achieving compliance against regulations such as FISMA, HIPAA, CCPA, GDPR, PCI and PII, among others. In this webinar quickly learn best practices in Information Assurance to automate regulation and compliance to achieve accountable security using controls, policies and more than check-the-box actions. Join the GRC & IT Webinar Series for byte-sized sessions aimed at making federal regulations understandable and actionable.HIPAA compliance remains critical for all healthcare organizations to combat security breaches. It is no surprise that the Healthcare industry remains one of the top targets for cyber-attacks. To avoid hefty fines and to gain the eagle eye view of the overall health of the organizations, GRC, IT Security and Compliance teams are quickly developing strategies to mitigate security breaches and achieve compliance to HIPAA. 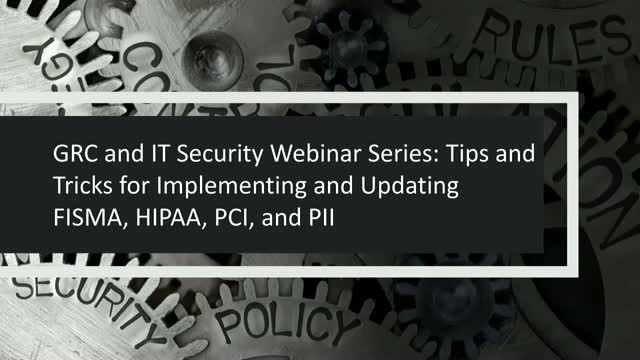 Join this bite-sized webinar to learn how organizations are tackling HIPAA. -Understand how continuous monitoring of HIPAA control health can eradicate failing health scores. -See checks and balances to confirm implementation and policy health. -Understand how continuous monitoring of Policy control health can eradicate failing scores. -Understand how continuous monitoring of NIST and RMF control health can eradicate failing health scores. -Understand how continuous monitoring of GDPR control health can eradicate fines and failing GDPR assessment reports. -How to align the security objectives with NIST 800-53 security controls and map them to events, giving you complete accountable security. -What teams should be involved and have responsibility? How do organizations comply with complex mandates? This task is often overwhelming, and the solution is often expensive and may require outside help to conduct a lengthy gap analysis. The output is a long list of urgent actions to accomplish again this year just like last year—not helpful. Organizations of all size are continuously tasked with building, updating, or revitalizing their cybersecurity strategies. Breaking news stories of organizations being hacked splash across major news outlets headlines on an increasingly frequent basis. The question is how can you gain the strongest security infrastructure all while reducing costs and man hours? Join renowned security expert Jeffrey Lush of BAP in the first webinar in our Jumpstart Cybersecurity webinar series. This webinar will give you practical information to build, analyze and protect your organization. -Preparing yourself for federal regulations such as DFARS, GDPR, HIPAA and more. BAP was created to give organizations an innovative way to tackle security visibility. By connecting key congruities between security policy and events, these webinars enables organizations, for the first time, to learn how to automate policy control implementation. By applying artificial intelligence to policy and standards. Learn how to gives governance and technology unprecedented, real-time reciprocity and accountability.